Looking for an activity that is fun and economical? Why not visit the local farmers market? Visiting the local farmers market is a great family activity. There is a variety of fresh fruits, vegetables, and herbs to choose from. 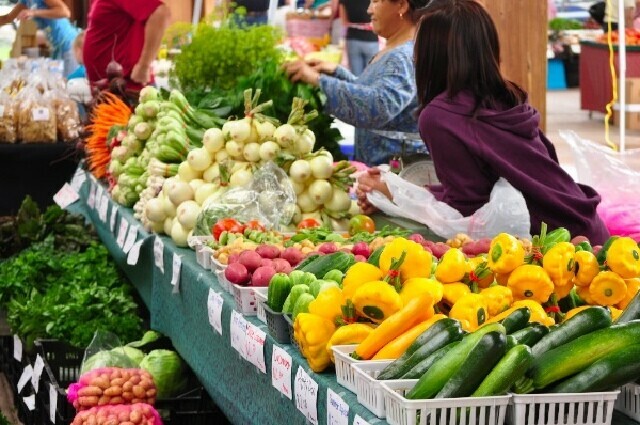 Buying fruits, vegetables, and herbs at the farmers market supports the local economy and farmers. You also have a chance to ask the farmers how the produce was grown.You can involve your children in choosing fruits and vegetables. For younger children, give them a choice of two foods at a time to select from such as broccoli or cauliflower. For older children, they have a chance to discover new less-familiar vegetables such as an eggplant, kohlrabi, or zucchini. There may be free samples to try. Shop early in the morning for the best selection. Shop through-out the farmers’ market season. Different vegetables and fruits are sold each month. You will find that farmers have more to sell after July 15.